Let's talk traditions, shall we? One thing I don't remember doing on Christmas morning was eating breakfast. I think that was because once all of the present opening was complete, my mom and dad immediately went into the kitchen to get everything ready for the big dinner while my sibling and I got cleaned up to visit our family. There really was no time to stop and make breakfast, but I have to admit, I think that a traditional family breakfast after gifts would have been lovely. So when I got married, I decided that I wanted a special breakfast on Christmas morning to be a part of our traditions. 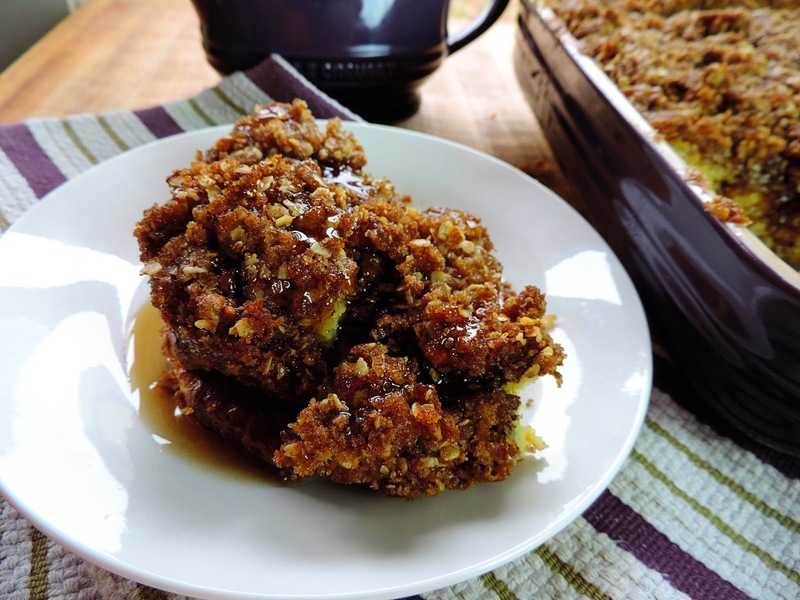 I like to keep things simple, and my French Toast Casserole is perfect for this because everything can be assembled the night before, and all you have to do on Christmas morning is bake it off! You won't believe how simple it is so let's get started! If you are going to bake this immediately after you assemble it, you will need to preheat the oven to 350 degrees. Now we can begin assembling the casserole. First you will need to cube or tear the croissants and place them into a greased 9x13 baking dish. I like using the croissants because they give the casserole a light, flaky, and buttery flavor. Time to make the custard. In a separate mixing bowl, combine the eggs, half and half, sugar, vanilla and cinnamon. Whisk together until all the eggs have broken apart and the custard is smooth. Now, using your hands or a rubber spatula, press the bread into the custard. you want the bread to drink up every last bit. It should look a little something like this when you are finished. Next, we can turn our attention to the topping. I love this topping because it give this decadent casserole a lovely, candy-like, crunch. In a mixing bowl, combine the oats, flour, brown sugar, butter, salt, and cinnamon. 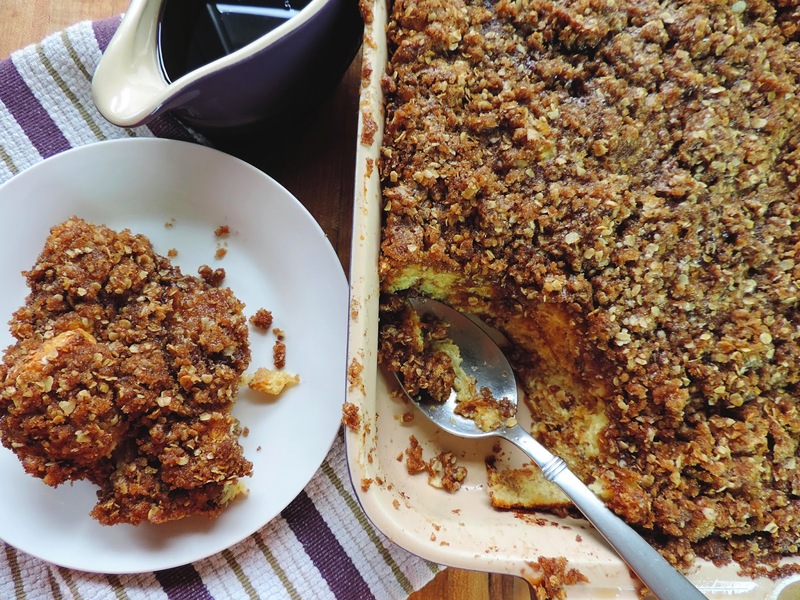 Then, with you fingers, mix everything together till it resembles a crumble topping. Now you can sprinkle it all over the top. At this point you can cover it with cling wrap and place in the refrigerator until the morning. In the morning you can preheat your oven to 350 degrees and bake the casserole for 1 hour. If you plan it right, it SHOULD/COULD be ready just as your are finished opening your gifts. 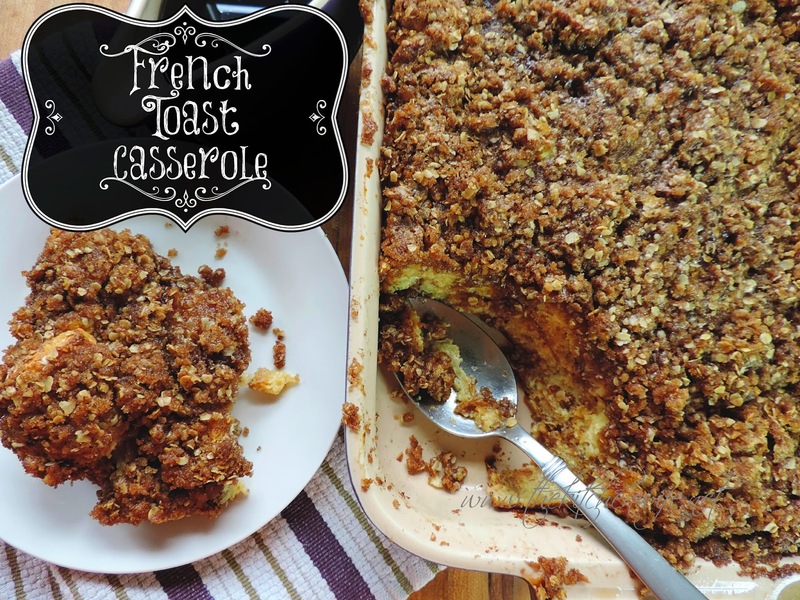 This French Toast Casserole is definitely Christmas breakfast worthy! Imagine the cinnamon and caramelizing sugar wafting through your house as you enjoy your special morning with your family. Drizzle with a little fresh maple syrup and ENJOY! It is sweet, crunchy, rich, flaky, buttery...Everything you want in french toast without the hassle of frying it piece by piece! You and your family are going to love this and I know it is going to be a new Christmas morning tradition in your home as well! Cube or tear the croissants and place in a 9x13, greased, baking dish. In a mixing bowl combine eggs, half and half, sugar, vanilla, and cinnamon. Whisk until smooth. Pour the custard over the bread and press with your hand or spatula and let soak. In a mixing bowl, combine the oats, flour, brown sugar, butter, cinnamon, and salt. Work all the ingredients together until they form a crumble. *If you are baking the next day you would wrap with cling film and place in the refrigerator at this point.